Wireless signal problems in Newbury Park, Thousand Oaks and Westlake Village are a recurring problem. Internet connect ability with a wireless routers throughout the office location for employees to use is an important for many modern day office locations in the Conejo Valley. Our team of certified computer repair in Newbury Park, Thousand Oaks, Westlake Village and Agoura Hills specialize have installed many wireless networks for home or office. It is important to know what obstructions are dampening your wireless network’s signal. If you’ve followed the advice in my article, “How to Improve Your Video-Streaming Clarity,” and can’t use a Cat 5e or greater specification wired-solution for your network, you may be running into straightforward environmental limitations. The microwave just isn’t getting from point A to point B and back again. WiFi at 2.4 and 5 GHz consists of short radio waves, unlike those of broadcast radio, for example. Place a solid object, like a wall, in front of a WiFi radio wave and, unlike many other forms or radio, you’ll get problems — the stubby, low-powered wave gets blocked. The advantage of a low-power, short wave for a private, local network is that the wave can’t get very far. This means a lot of users can share the same spectrum. But, it’s also the technology’s disadvantage for those looking for long range through structures. Follow these tips to simply expand the range of your network into dead-spots. Our certified wired network and wireless network support team for business in Newbury Park, Thousand Oaks, Westlake Village, and Agoura Hills have troubleshooted many wireless signal problems. We have fixed many dead-spots. Remove any obstructions between the antenna on the router and the network equipment, like a laptop. Place the WiFi router in the center of the space to be covered by the signal — away from walls and metal, like filing cabinets. If the WiFi router can’t be moved to the center of the area to be covered, or you still have trouble, repeat the signal by purchasing a Wireless Range Extender. They are a more practical, professional and aesthetically pleasing solution than messing around with home-made aluminum-foil antennas, tin cans and such, that focus the signal in one direction. 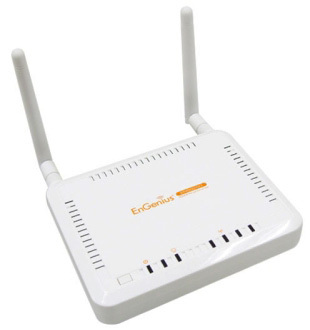 I’ve been using EnGenius’ US$50.00 ERB9250 300 Mbps Wireless N Range Extender that also, crucially, handles the still-common older WiFi standards, 802.11B and 802.11G. Many range extenders only work on the latest 802.11N standard, which is okay if that’s the standard your router uses. Our certified router and wireless network support team for business in Newbury Park, Thousand Oaks, Westlake Village, and Agoura Hills have troubleshooted many wireless signal problems. However, many router/modem combos provided by ISPs, like your phone company, use the older 802.11G wireless standard, and will not work properly with an extender designed specifically, and only for 802.11N. Check the extender’s packaging. Look for 300 Mbps or higher speed designated on the extender’s packaging too. This 802.11N-capacity theoretical speed is at the top end of available wireless Internet speed. It will indicate that you’re buying the highest capacity gear available, that it will allow for future upgrading, and that it will be beneficial in compensating for speed losses over range and between the now accumulating network devices. Our certified wired network and wireless network support team for business in Newbury Park, Thousand Oaks, Westlake Village, and Agoura Hills have troubleshooted many wireless signal problems. We have fixed many dead-spots. Verify that the Internet is on and the router is functioning by checking for Internet activity from the router with a laptop moved near to it. Then set up the Extender. Follow the setup instructions that are provided by the extender manufacturer. Disable the wireless radio on the laptop, and connect the extender to the laptop’s RJ45 Ethernet port with the likely supplied Ethernet cable. Enter the extender’s default IP address from the documentation into a Web browser on the laptop and follow the instructions or wizard to perform a scan for available wireless networks. Then connect to your network with the wizard and enter any required password. Complete any further instructions, remove the cable, and restart the wireless radio on the laptop. Our certified wired network and wireless network support team for business in Newbury Park, Thousand Oaks, Westlake Village, and Agoura Hills have troubleshooted many wireless signal problems. We have fixed many dead-spots. Perform a survey by identifying the area where signal is poor and where you want better Quality of Service. Smartphone apps are available in the respective Store and Market that you can download to your phone to do this. I’ve been using Farproc’s free WiFi Analyzer for Android smartphones, which graphically shows WiFi signals around you. You’ll see the wireless network’s name, called an “SSID,” with graphically depicted signal strength levels. Low levels indicate dead spots. Identify the best location for the extender. You’ll need an adjacent household power outlet. Look for a WiFi signal on your analyzer app that’s greater than the signal at the dead-spot location that you obtained in the previous step. An optimum extender location is line-of-sight somewhere between the router and dead spot. You can either use a straight line or a horizontal elbow-like position where the router and laptop are at shoulder and hand, and the extender is at the imagined elbow. The extender will then repeat the signal obtained from the router, and the laptop at the dead spot will pick up the repeated signal, not the original signal. The key is to get the extender within range of the router and the laptop within range of the extender. The laptop doesn’t have to be within range of the router. Remember that because of the shortness of the radio wave, line-of-sight will always be best. Use interior window ledges to get signals between buildings. Our certified wired network and wireless network support team for business in Newbury Park, Thousand Oaks, Westlake Village, and Agoura Hills have troubleshooted many wireless signal problems. We have fixed many dead-spots. Position the laptop near the extender and open the wireless configuration setting on the laptop. You should see two wireless networks with the same name. One will show a stronger signal than the other. Choose that network to connect to. Then move the laptop to the former dead spot, and any performance issues will be corrected.